LABOUR MADE STRONG, and unexpected, gains in the UK general election and the oft-dismissed vote from 18- to 25-year-olds played a key role according to exit poll data. Turnout among younger people is often lower than other age groups. According to YouGov, only 43% of 18- to 24-year-olds voted in the 2015 general election. This time, however, reports of turnout among young people was strong across the UK, with a string of polls ahead of the election predicting that the younger generation would vote overwhelmingly for Labour. Queues were noted outside many university polling stations yesterday, as students turned out to vote. According a YouGov exit poll, 63% of voters aged 34 and under said they would vote Labour, compared to only 27% for the Conservatives. This position is reversed for people over the age of 55, on the other hand, with 59% voting Conservative. In his speech after being re-elected in his London constituency of Islington, Labour leader Jeremy Corbyn said that people were fed up with “austerity politics”. “Politics has changed,” he said. “Politics isn’t going back into the box where it was before. What’s happened is people have said they’ve had quite enough of austerity politics. They’ve had quite enough of cuts in public expenditure, underfunding our health service, underfunding our schools, underfunding our education service and not giving our young people the chance they deserve in society. Relaxed and tie-less, he came across at lively rallies as an amiable underdog making a principled stand for society’s poorest and managed to appeal to many younger voters. “Jeremy Corbyn appears to have been vindicated,” said Mike Finn, politics researcher at the University of Warwick. “It seems now clear that his approach to Labour politics resonates with the public and he is undeniably strengthened,” he said. 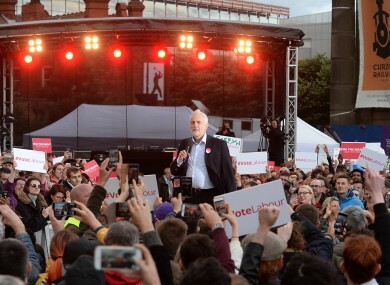 At a rally earlier this week, comedian and actor Steve Coogan hosted an event where Corbyn was speaking and urged the 1,000-strong young attendees to “rise like lions from the slumber”. Corbyn also had a groundswell of support from artists in the UK’s popular grime music scene with the hashtag #Grime4Corbyn trending on several occasions during the election. Grime star Jme instructed his 700,000 followers to vote for Corbyn, and Corbyn even retweeted his thanks. Corbyn also received an endorsement from Professor Green and rapper Akala, who tweeted a series of messages in support of “homie Jeremy Corbyn” and even wrote an op-ed in the Guardian. In a Channel 4 report on the support for Corbyn among grime artists, reporter Symeon Brown detailed how ethnic minorities were being encouraged to vote, and vote for Corbyn, by major players on the scene. Turnout as a whole is the highest it’s been for a general election for 20 years at nearly 69%, according to Associated Press reporter Ian Jones. CEO of pollsters Ipsos Mori, Ben Page, also said that the data showed that young people had voted in their droves. Email “With support from grime artists and actors, young voters turned out in droves for Corbyn”. Feedback on “With support from grime artists and actors, young voters turned out in droves for Corbyn”.